I love when I get visits on my site from friends who aren’t food bloggers. Last week, our computer tutor emailed me that he and his wife made my butternut squash risotto. And this week, one of Larry’s colleagues emailed me a recipe for low calorie brownies that I renamed “skinny” brownies. Not much of a baker or chocoholic, I immediately thought of the February Chocolate Blog Hop coming up with the theme being chocolate. After a little research, I discovered the recipe was called “Amaretto Fudge Brownies” from the Weight Watchers One Pot Cookbook. For me, the combination of amaretto and chocolate didn’t set off any fireworks, but adding orange liqueur and orange zest sounded pretty good. Orange and chocolate is a favorite combination of mine. I substituted decaf coffee crystals instead of espresso. Grand Marnier was my choice for the liqueur and I added fresh orange juice. Somehow, I knew my pan of brownies would fall short of the 16 promised in the original recipe. Even so, they weigh in under 150 calories and are low in fat and sodium. Larry ate four, so I guess they passed the taste test. Thanks to Susan for including me in the blog hop! 2. Grease an 8-inch square baking dish with the oil. 4. Using a large bowl, whisk together the egg, egg white, liqueur, orange zest and vanilla. 5. Stir in the sugar, melted butter and orange juice. Mix well. 6. Add the cocoa and coffee granules. 7. Add the flour mixture and the walnuts. Stir gently until just blended. 8. Pour into greased dish and bake for 18 minutes. Cut into squares when cooled. 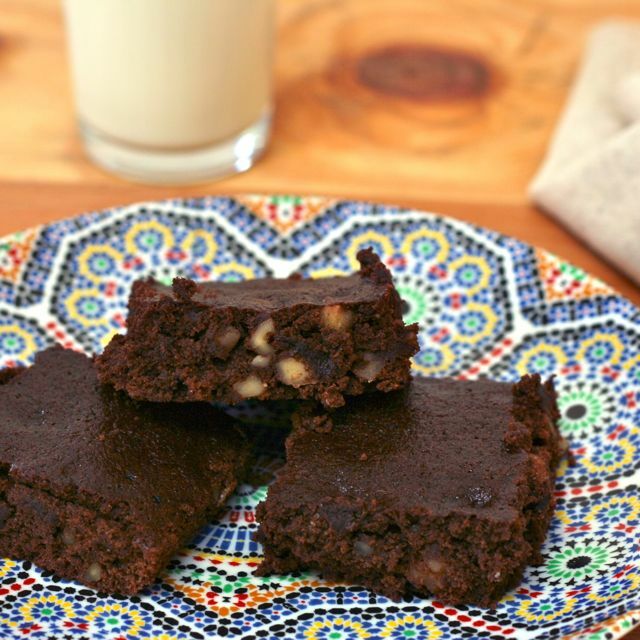 Those look great, who can say no to a skinny brownie, will try these! I love low-fat baked goods for the same reason Larry does, I can eat 4 of them at a go! I would call this the oxymoron brownie. I love all of the orange in it! Me too – and you can really taste the orange. Never thought I’d hear skinny and brownie in the same sentence! Great idea, I also love the chocolate orange combo! Can’t wait to try these! Jayne, is it snowing in London for real?! Thanks – love the blog hop!! Wow – coffee + orange + chocolate brownies? That are skinny? Definitely need to try these out. I’m hiding these from myself – does that make sense? Never thought of putting oranges into brownies. Looks great! These look absolutely perfect, Liz!!! Orange and chocolate is a fabulous combination. I’m so glad you made these for the chocolate bloghop!! Yay!!! Chocolate and Orange are like love and marriage 🙂 These look delightful Liz! Congrats on blog hop too. I get all the emails, but have not been able to join yet. Yum, yum, yum. There are nothing skinny about this recipe. Abundant brownies maybe… Thanks, Liz, for all the inspiration. Hey, Sue, guess are were right..
Hi Liz – I wanted to let you know I awarded you the Liebster Award today on my blog in my newest post. It’s one more way to let you know how much I enjoy your blog!! Go check out the award on my site! And these are SKINNY?! Woah, I need to make these ASAP! They were a big hit – let us all know if you try them? Thanks for your visit! Orange liqueur in brownies… heaven! Who can resist a brownie? And with Grand Marnier? I’ll take a dozen, thanks! skinny or not, i love brownies! yay for skinny brownies! i have such a weakness for them. 🙂 sending some #chocolatelove to you! Thanks, the blog hop is so much fun, especially #chocolatelove. Already thinking about greens for March, though. On vacation -will do so upon our return in a week or so. I lost the original recipe, but I would omit the orange juice, orange zest and Grand Marnier – substitute 3 tablespoons of Amaretto instead…Good luck!